Which ‘Belt’ is right for you? On many occasions, people are unsure as to which ‘Belt’ they should aim for. Understandable given that each belt is designed to provide the intelligence appropriate to the role. This paper aims to clarify the above question which in turn will provide those that are unsure a clearer picture of where to pitch their training. It should be noted that the different levels of ‘Belts’ is very useful for succession planning. The transition from one ‘Belt’ to another embraces the personal development of individuals and teams in addition to the significant business benefits that effective deployment of the learning can bring. The Yellow Belt is typically designed for ‘front line’ operators, in other words those that undertake the process day in, day out. They are regarded as functional experts and are a very important part of the Lean Six Sigma journey. Yellow Belts often become Green Belts as part of the personal development as described above. YB’s possess an understanding of the concept, purpose and objectives of Lean Six Sigma. Often, and sadly, YB’s are the ‘unsung heroes’ in the Lean Six Sigma world! 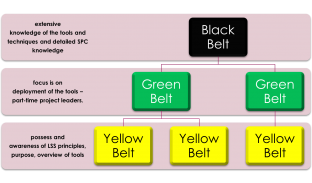 Green Belts are practitioners and lead ‘small’ projects (usually under the direction of a Black Belt). Usually designed for first line and middle management (but not exclusively) who are responsible for a team of people. This population would include e.g. supervisors, department managers, business improvement leaders, PMO’s, project managers and CI teams. GB’s have a full understanding of the DMAIC model and how to deploy the fundamentals. Regarded as ‘advanced practitioners,’ Black Belts lead large projects. These will include a team consisting of YB’s and GB’s but the inclusion of ‘non-belts’ is a critical element of gaining engagement! BB’s possess in-depth intelligence of the approaches, tools and techniques of Lean Six Sigma including SPC and of course, the all-important leadership skills required to inspire and motivate! Middle/senior management tend to be BB’s. The descriptions above provide a summary of the role of each belt and it should be recognised that the structure should be built that meets the needs of the organisation. As a guide to how the structure could look in your organisation, the following should be considered. Of course, this very much depends on the size of your organisation and ‘smaller’ organisations of say, 40 employees may want to have all employees trained to a ‘belt’ level consisting of YB’s, GB’s and possibly 1 or 2 BB’s. Larger organisations (e.g. those with hundreds or even thousands of employees) will need to assess the requirement across the breadth of the organisation. And that is an important point. Being mindful that ‘true’ Lean Six Sigma organisations have a culture that demonstrates this, it is vital that ‘belts’ are aligned across the different functions within the business e.g. HR, Sales, Marketing, Operations, Finance, IT etc. I have never come across any organisation yet that has reaped the significant rewards that LSS can bring with only 1 or 2 belts! Typically, there are 3-5 Yellow Belts to 1 Green Belt and 3-5 Green Belts to 1 Black Belt. However, as described above, it is important to develop a structure that meets the requirements of the business and its objectives. Be aware not to overload GB’s at the expense of YB’s and the same goes for the BB’s. *MBB (Master Black Belts) are not commonly on the payroll. Please note that the number of belts shown in the table are spread across the organisation to include all functions. In summary, this overview aims to provide a guide in choosing which belt suits you best. And that is what it is – a summary. To expand on this into the real detail would lead to an additional 15 -20 pages!